What an unbelievable year it has been for the Irish National Stud Breeding and Racing Club. The club is made up of 22 like minded individuals who have experienced the best of what the thoroughbred industry has to offer this year. As well as having two winners in one week (including black type), the club have also experienced the joys of breeding top quality foals and selling them at the highest level. 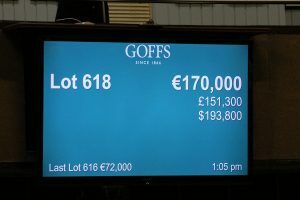 This week the club sold one of their two foals, an athletic No Nay Never filly out of Veronica Falls for €170,000. The filly’s pedigree has undergone an upgrade during the most recent campaign, as she is a half-sister to Chicas Amigas, who won two races this year for the It’s All About The Girls syndicate and Jessica Harrington as well as gaining valuable black type. Access to six top flat & national hunt racehorses that are placed with top trainers throughout Ireland. 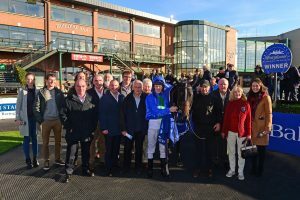 Owners and Trainers passes to Irish racecourses on the days in which the Club has a declared runner. 1% share of prize money. A share in 2 mares and foals, in which the foals are sold at the major auction houses in November. Unique industry events and visits. A family season ticket to the Irish National Stud worth €110. The opportunity to join a community of racing enthusiasts. Access to the INS state of the art platform which shares information on the horses in training, industry news and updates.